The Warriors graduated a lot of talent from last year’s squad, including its two leading scorers but Tony Bozza brings a wealth of experience back up front this season. 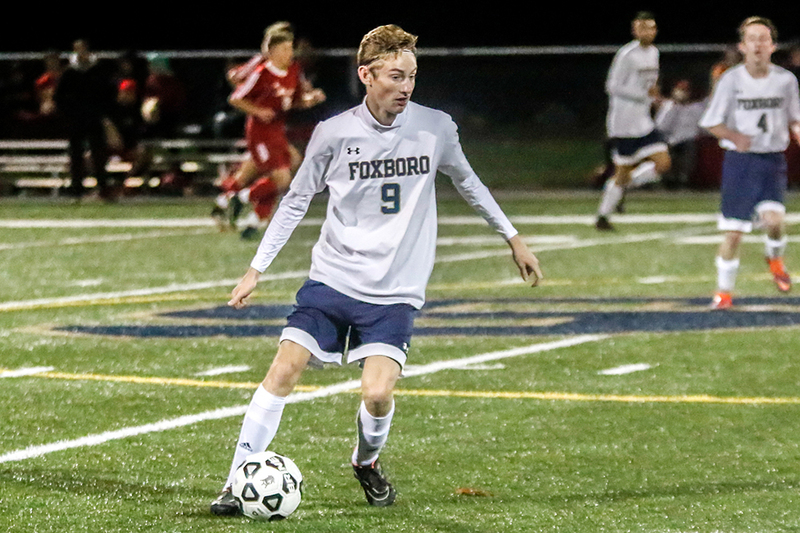 Bozza, who scored three goals and had six assists last season, will be one of the main options for KP’s offense after losing leading scorers Tyler Mann and Thomas Lugten to graduation. Bozza is in his third year on varsity and played plenty of minutes of each of the first two, so his experience is going to be key this year. The Warriors have a knack for scoring off combination play and through balls and Bozza can work in tight situations, which is important for King Philip’s offense this season. There aren’t many harder working players in the league than Franklin senior Nitin Chaudhury. If you’re looking for a player that puts his head down, works his tail off, and puts the team first, look no further than Chaudhury. He’s one of the fastest players in the league and is always looking to make plays for his teammates. The Panthers were a relatively inexperienced group last season besides Chaudhury and a couple of other players. Now a year old, Chaudhury is one of 13 returning players and will be counted on for his leadership on and off the field. We expect Franklin to take a step forward this year and Chaudhury’s ability to put teammates in good spots will be a big reason why. Not many teams have the luxury of returning their top scorer, but Canton is one of those teams. And not only did Corcoran lead the Bulldogs in scoring, but he was also the top scorer in the Hockomock League with a league-best 15 goals and league-high 23 points. Corcoran has been a key playmaker for Canton for two straight years, earning HockomockSports.com Underclassman of the Year honors in 2016. His combination of speed and skill make him one of the most dangerous players on the wing. He’s shown the ability to beat players one-on-one and go at goal with pace. His finishing ability has improved each of the last two seasons as well. His speed also makes him an option to run onto balls over the top or through the defense, which is another reason he was the top scorer last season. No one had a breakout season last year like Walisson de Oliveira did for the Hawks. After starting at center ___ for the first half of the season, head coach Brian Edwards moved him up to striker, and the rest was history. De Oliveira dominated the rest of the way, scoring 14 goals and adding three assists. His 14 goals were tied for second in the league, and he finished top five in points overall. Not only can he hold possession up with his back to goal, allowing the rest of the offense to get in gear, he can turn and go at goal with pace. He can beat defenders in one-on-one situations and, as we saw plenty of times last year, he can finish in a variety of ways. He can finish off crosses or he can hurt you from distance. For the past two seasons, Will Halben has been one of the most dangerous players in the final third. We have bad news for opposing defense: he’s back for another year. Now a senior, Halben (12 goals in last two seasons) is ready to be the main focal point of the Bombardiers’ offense. Despite drawing extra attention since his sophomore year, Halben has found ways to get open in the area and make defenses pay. He isn’t the tallest or strongest player in the league, but he’s got a nose for goal which is exactly what you want in a striker. He’s the ultimate opportunist and will cash in if defenses give him the chance. Almost every team in the Hockomock League lost their starting goalkeeper from last year but Sharon will have a very familiar face in net this season. Senior Ethan Kantor enters his third season as the Eagles’ starting keeper and for good reason. He established himself as one of the top keepers in the area during a breakout sophomore campaign and kept it up again last year. Now as a senior, expect Kantor to have complete control of his area. Over the last two years, Kantor has been very good in the air at picking our crosses and preventing teams from getting much going aerially. He also has very good instincts which allow him to get at least a hand to a lot of shots. Kantor will be a very important piece of Sharon’s defense this season. Mansfield graduated over a dozen seniors last season and the majority of its starting lineup, but the good news is that EMass All Star and all-league selection Sam Nugent is back in the heart of the defense. In his first year starting, Nugent emerged as a steady presence on the Hornets’ back line in 2017. After being a big reason that the Hornets allowed just 18 goals last season, Nugent is back to anchor this year’s defense which looks to be a strong point for Mansfield. Nugent is like a quarterback on the defensive end, helping the backline keep its shape. He is strong in the air as well, often being the one to come up with a big clearance on corners or set pieces. While the Hornets search for names to step on the offensive end, they can count on Nugent and the defense to be rock solid. After a down year in 2017, there is optimism for a bounce-back year for the Black Knights. One main reason for that is four-year varsity starter Fabi Ponce de Leon, who will look to lead the Knights from his spot in central midfield. We’ve seen over the course of three years just how skilled Ponce de Leon is with the ball on his feet. He can help translate defense to offense and is a calming presence on the ball. When Stoughton is looking to build its offense, it’s likely going to come through Ponce de Leon at some point. Whether it be in just keeping possession or hitting the through ball in the final third, expect him to be the engine for Stoughton this season. Not many players look as comfortable with the ball at their feet than Canton senior Griffin Roach. He burst onto the scene last year and really stood out as one of the top midfielder’s in the league, earning a HockomockSports.com Best XI selection. He is just one of four returners from the Best XI and the lone midfielder of the group. He is very strong on the ball, making it hard to dispossess him. At the same time, he has great defensive instincts and can win a lot of duels in the midfield for the Bulldogs. He showed last year how dangerous he is in the final third, scoring 10 goals and adding five assists. Roach and Paul Corcoran give Canton one of the most dangerous attacking duos in the league. There is a lot of optimism in Foxboro this season and having Shane VandenBoom back up top is one of the reasons. After a breakout junior campaign in which he terrorized defenses and scored 12 goals and had nine assists (21 points, second most in the Hock), VandenBoom is back for his senior year ready to do more of the season. He is one of the most dangerous players in the final third because he is so multi-dimensional. He showed last year that he can finish but he also showed he can set teammates up. If given time and space in the final third, expect VandenBoom to create some sort of chance whether it’s for himself or for someone else.